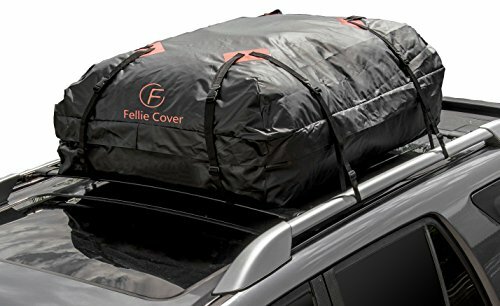 F Fellie Cover Roof Cargo Bag is a good solution for across-country moving or camping, durable and designed to last! Material: Heavy Duty 600D polyster fabric with waterproof PVC linning, durable and designed to last! Overall Dimensions: 120x86x43cm / 47"x34"x17"
Suitable for ANY CAR with roof rails and bars. 100% fully waterproof, offers the best weather protection. The waterproof zipper is inside of the anti-rain flap designed to help seal out water. With the 8 heavy duty wide straps & buckles that secure your stuff easily on rough road and no problem with noise for traveling or off- road. Massive 16 Cubic Feet Capacity, increase vehicle cargo space for your road trip. Folds easily and put it in the storage bag when it's not in use. Designed for cars, vehicles, vans, RVs, SUVs with roof rack systems. --2-Year Worry-free Warranty if there is any quality issue. Avoid direct contact with cargo bag when you want to put sharp objects, please wrap them in a soft cloth before putting in. Remember to check the straps of the carrier regularly throughout your trip. Pack the cargo bag full so that the sides are pulled tight to prevent excess material from flapping in the wind which can damage the rooftop carrier and cause the load to shift, loosening the straps. ★Waterproof Cargo Bag: This rooftop cargo bag is constructed from 100% waterproof anti-rip, anti-peel, and anti-crack fabric with ultra-strong dual seam technology, completely waterproof and weatherproof when you go on a lot of road trips! ★The Largest Cargo Space: The rooftop cargo bag with 16 cubic feet space (43"x34"x17") maximize your car's cargo space that is very convenient for you to put luggage, sleeping bags, camping gear and other over-sized items. ★Heavy-Duty Wide Straps & Buckles: The rooftop bag built-in 8 strong nylon straps with buckles which can set up very security on high way, even drove on rough road, No road noise or flapping when it is tied down properly, and the straps are NOT quite easily frayed. ★Easy to Install and Store: Easily attach to most vehicles, Cars, SUVs, Vans, RVs, Jeeps with roof rack systems; Folds compact for easy storage with handy storage bag. ★Please confirm your car has luggage rack, cross bar or side rail before purchasing. 2-Year Warranty provided by our Car Roof Storage Bags. If you have any questions about this product by F Fellie Cover, contact us by completing and submitting the form below. If you are looking for a specif part number, please include it with your message.